This week I’m in DeKalb, Illinois doing support and I’m staying near NIU, Northern Illinois University. I told dad and his question… do they have tshirts?! So yesterday after work, I stopped by the NIU campus bookstore to get dad a shirt, got one for me too, I know, shocker! While I was walking to the bookstore, I saw all of these markers. Crosses with hearts, names, dates, ages, numbers. Some had photos, some had flowers. I knew it was a tribute to something and someone, but I wasn’t sure what they were for. I had a feeling it was for those who had passed on, possibly students from the university, but then I noticed the ages. They ranged up and down the scale, men, women, children, races. I asked in the bookstore and was told it was to honor those killed in Chicago so far this year. If there are more before the prayer vigil and duscussion tomorrow, there will be more markers. 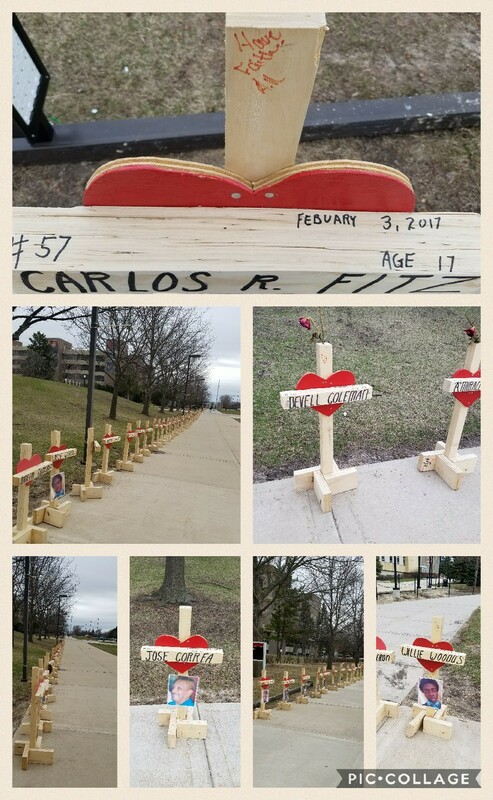 Greg Zanis, the man who carved the crosses and began the tribute, who is a non-for-profit carpenter, feels that this is the petefct way to raise awareness of what is going on in Chicago and the university is the perfect place with so many students who live in Chicago. It was chilling and makes you think. You know there is violence in the world, you know it can be in your backyard, but unless it touches you directly, you may not realize just how close you are. There are 128 markers here. It’s only March 23rd.